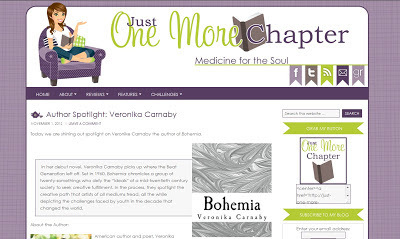 In Veronika Carnaby's latest interview, the author discusses Bohemia and more about her writing process. Jack Kerouac’s On the Road was the first that truly peeled me eyes to the craft of storytelling. That’s not to say that others I’d read weren’t just as great, but after reading Kerouac’s best, it helped me see all the other works in a different light. Visit Just One More Chapter to read the entire interview transcript.